Silicon Valley, the most dynamic and innovative economic engine in the world, is not creating great urban places. Having grown around the automobile, the valley consists largely of lowslung office parks, surface parking and suburban tract homes. But the City of San Jose's ambitious new General Plan imagines a dramatic shift to mixed, walkable “complete neighborhoods” that provide basic services and amenities close to homes, workplaces and transit. Achieving this transformation will be a daunting challenge. To be successful, it will require changes in culture, public policy, professional and technical practices, infrastructure, markets and norms. 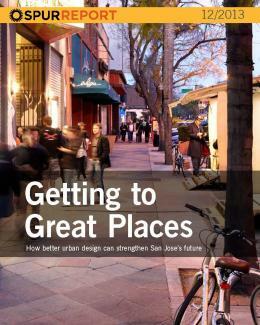 SPUR’s report Getting to Great Places diagnoses the impediments San Jose faces in creating excellent, walkable urban places and recommends changes in policy and practice that will help meet these goals. Thanks to the generous support of the Silicon Valley Community Foundation. The SPUR San Jose Advisory Board reviewed, debated and adopted this report as SPUR policy on August 15, 2013. Erik Schoennauer, The Schoennauer Co.
Michael Yarne, Partner, Build Inc.